: LBEvo SpringBoard "You've never customized the SpringBoard quite like this"
LBEvo SpringBoard "You've never customized the SpringBoard quite like this"
With the addition on SBHTML adding html to the springboard. I have modified LockBuilder Evo to create layouts to send to an html on the springboard. With no respring needed. Simply open SBHTML in settings and choose LBEvoSB. Once you have done this, you can jump into LockBuilder and create any layout from the vast amount of items. 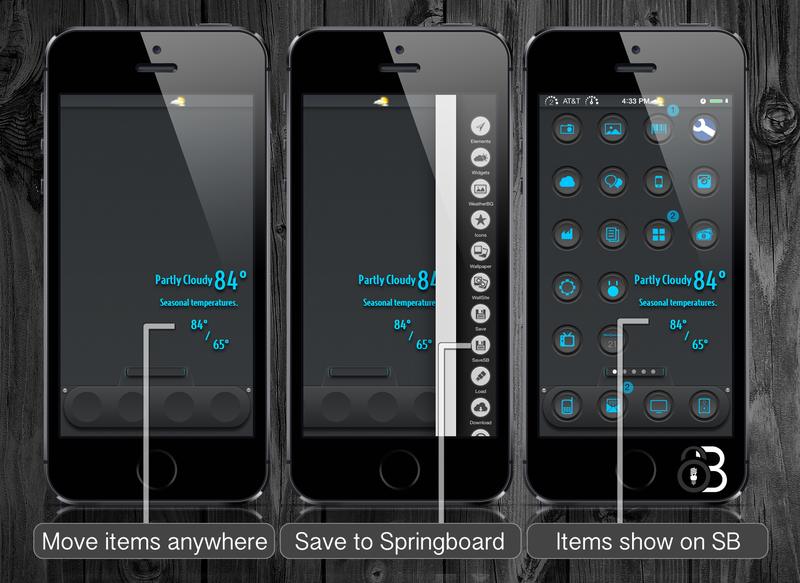 Move, color, change opacity, rotate any item, it will display on the springboard as you have set. Easily take a screenshot of your springboard, set it as a wallpaper in LB and begin designing. GroovyLocks, and iWidgets can be applied through LockBuilder. This will give you the option to have one iWidget yet it will display on every page. For GroovyLocks you won't have to modify them to work in SBHTML, just apply from LockBuilder. This won't effect LockBuilder at all, you can set a theme just as normal to the lockscreen. Then set another to Springboard. Reset button has been reconfigured in LockBuilderEvo 1.2. Popups will ask if you would like to delete all cache, Lockscreen cache, or Springboard cache independently. Weather walls button has been added to LBEvo in 1.2 press this, then save to SB, and immediately you have a weather wallpaper on the springboard. Animated weather will also work if Saved to SB. LBEvoSB will only change its layout if you press SaveSB. It creates a unique id, if the id's match it wont refresh. When the id's change it refreshed the Springboard wallpaper. "You keep sharing our links, we will keep making them"